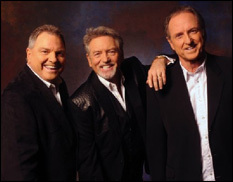 NASHVILLE, TN (CelebrityAccess) — Country pop legends Larry Gatlin & the Gatlin Brothers have announced plans to hit the road for their 60th anniversary tour and while the Gatlins aren't quite saying farewell, they did say they plan to "slow down" a little after this outing. "We’re not calling it a farewell or a final tour. We’re calling it the 60th Anniversary Celebration. By no means are we retiring, but after this tour, we are going to slow down a little bit. The promoters are going to have to want us about three times more than they want us right now," Larry Gatlin said. The tour is set to get underway at the Harrington Raceway and Casino on February 6th, and run through most of 2015 before wrapping up with a final show at the Henrico Theatre in Highland Springs, VA on Nov. 14th. The Gatlin Brothers first rose to national prominence in the late 1970s and Gatlin has notched up an impressive 33 Top 40 singles either as a solo artist, or performing with his brothers, including the "Night Time Magic," "All The Gold in California," "Houston (Means I'm One Day Closer To You)" and the Grammy-winning "Broken Lady."